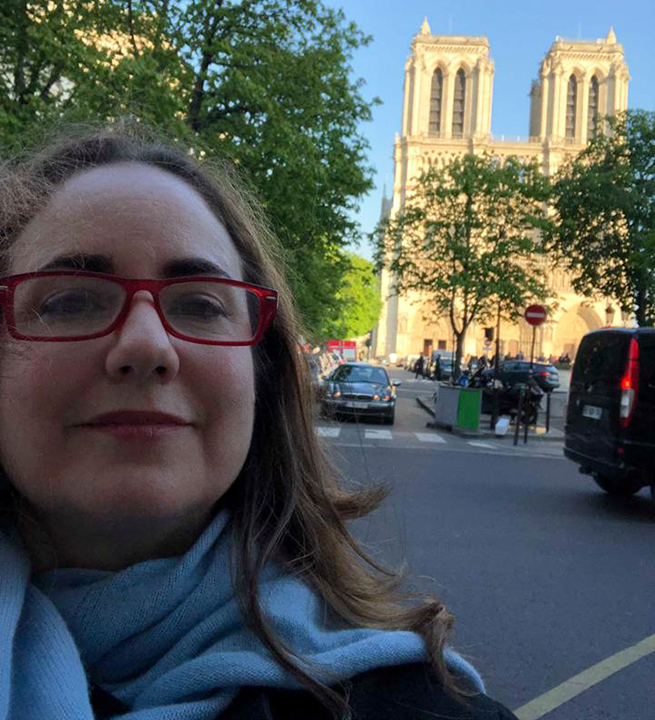 Sophia Ferero, a Naperville jewelry designer, was walking along the Seine with her husband when she saw the massive Notre Dame fire. "I know it's such an important symbol for the French people. I was moved to tears," she said. A Naperville jewelry designer and her husband were walking along the Seine River in Paris on Monday when they turned a corner and saw the massive fire at the iconic Notre Dame cathedral. "I was speechless," said Sophia Ferero. "I know it's such an important symbol for the French people. I was moved to tears." People were weeping in the streets as they watched the blaze. Plumes of smoke drifted along the Seine River blocks from the church. Sophia Forero, of Naperville, describes the moments before seeing Notre Dame cathedral on fire. "There were people crying just watching the flames because it really is this iconic symbol of Paris and the French nation. And just to stand there, we felt helpless," Forero said. The historic 12th-century cathedral caught fire just before 7 p.m. local time. As ashes and embers blew onto bystanders and the streets, police removed bystanders from the riverfront. Sophia Forero, a Naperville jewelry designer, captured cellphone video of the moments after the Notre Dame cathedral started burning. A tourist had attempted to take a selfie with the burning church in the back, but a local Parisian girl stopped her to say, "Do you realize this is a symbol for the French people? Please don't take a selfie." "That spot where Notre Dame is, is where the Romans put the first temple," Forero said. "That's where France started. For them, it's an icon that is going down right in front of their eyes. In moments. Moments. This whole thing happened within 20 minutes. Several Chicagoans in Paris witnesses the catastrophic Notre Dame Cathedral fire. Forero and her husband, an artist, were in Paris for inspiration for their work and had just visited the church the day before. She said she had noticed the construction at the church, but noted that many old churches in Europe are usually under construction. However, she said it was overwhelming to think that she was just in the church 24 hours prior. "I'm very moved. I've never seen anything like that before," Forero said. Other Chicago area residents were also in Paris and witnessed the massive fire. Colleen Fairbanks, of Lombard, was among them. Sophia Forero, of Naperville, had visited the Notre Dame cathedral just one day before it caught fire. She and her husband were in line to see Notre Dame. The line was very long so they decided to go to the café across the street. While sitting at the café, about 90 minutes later, they saw people become very excited. Then, they saw the flames from the spire. "As more and more of the structure collapsed, the crowd sighed. Lots of crying. Lots of sadness," Fairbanks said. Fourth Presbyterian Church of Chicago associate organist Thom Gouwens performed at Notre Dame in 2017. Forty parishioners were with him for the performance, which he said he will never forget. "It's one of the thrills of my lifetime to play at such a beautiful place," Gouwens said. "I played a program of entirely French music." Now he worries the organ he played has been destroyed. "Even if there are parts of it that remain, there will be so much damage from the smoke and the heat it's probably ever going to be playable," he said. Witnesses said the flames appeared to originate in an area of the roof where scaffolding had been erected for a restoration project. By nightfall, the roof had collapsed, a dagger in the French heart. "It goes beyond where you are from and for my fellow Parisians it's obviously meaningful, and for people all over the world and them messages we are getting here today reflect that," said Geoffrey Ruiz, of the Alliance Francaise de Chicago. Gouwens took a moment to reflect today in Chicago as he sat in front of the organ in his church. "I was thinking 'Oh, this same organ counsel that I'm playing at now isn't there at Notre Dame Cathedral anymore.' And it was an emotional experience," he said. Chicagoans are heartbroken to see the tragic fire unfold at #NotreDameCathedral in our sister city of Paris. This historic cathedral is a treasure for the world. Chicago is keeping Mayor @Anne_Hidalgo & all our Parisian brothers & sisters in our thoughts on this difficult day. The spire above the Notre Dame cathedral toppled over after it was engulfed in flames amid a blaze that raged through the Paris landmark.